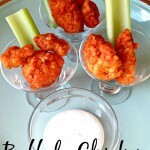 2 Ingredient Buffalo Chicken Bites, Perfect for Game Day Snacks! We threw an impromptu Seahawks get together yesterday, and I had to come up with some easy appetizers to serve at the last minute. Fortunately I had a bag of Foster Farms Frozen Chicken Strips and Popcorn Chicken in my freezer. 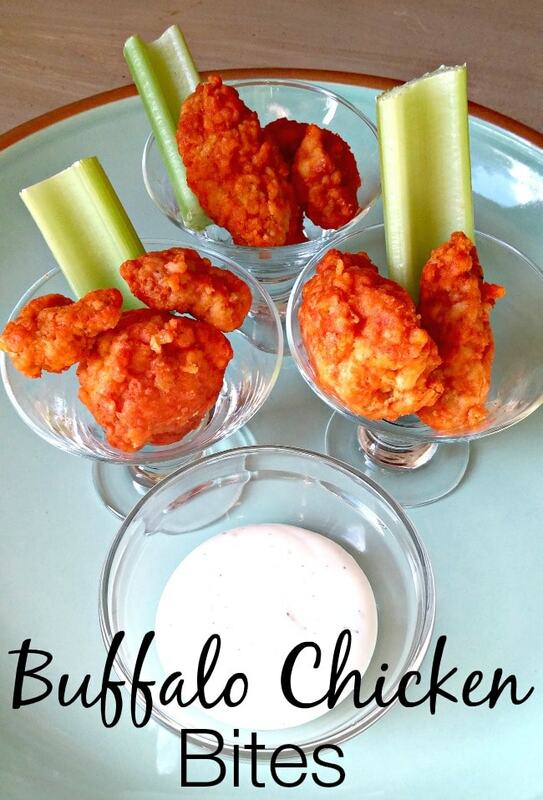 Buffalo chicken wings are a favorite for game time at our house, but I did not have time to thaw wings, and then fry them all up, so I used the Foster Farm Popcorn Chicken to make a super quick and easy version of Buffalo Chicken Wings. This dish is budget friendly, as it only requires two ingredients, but no one has to know how easy they are if you serve them in a pretty dish! The best part was that I could use half of the chicken to serve plain with dipping sauces for the kids, and everyone was happy! If you put the Buffalo Chicken bites into small serving dishes, they will really stretch to feed a crowd too. I had these mini martini glasses that my husband got me for Christmas. They fit three bites plus a celery stick (and serve with a side of ranch), and it makes a great single serve size if you are serving with other dishes. If you don’t have small glass dishes, you can also easily serve in a clear plastic cup (we got these at the $1 store). If your tailgating, this is a great way to dish them up and throw in a cooler. They are great chilled too, and just add a dollop of ranch right in the cup. 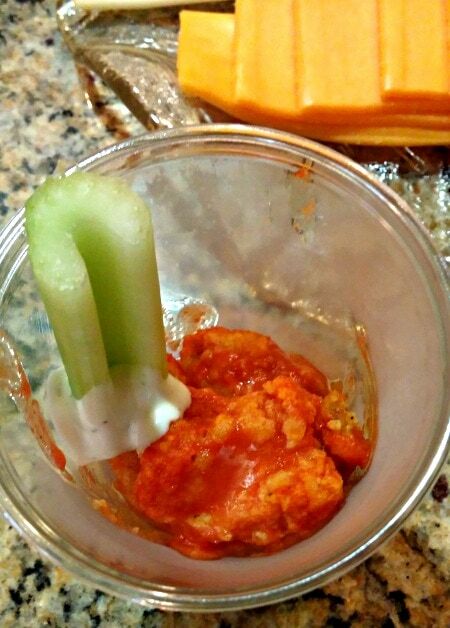 Optional – ranch dip and celery or carrots to serve with it. #1 – Bake the Popcorn Chicken according to to the instructions on the bag (cook it directly from the freezer, making it perfect for last minute get togethers). #2 – Add approximately 1/4 cup of Franks Red Hot Buffalo Hot Sauce (or your favorite Buffalo Sauce) to the pan (more or less depending on your taste). Toss until all pieces of the popcorn chicken are coated. #3 – Place it back in the oven and cook for 5 more minutes to let the sauce saturate the chicken, and set (so it goes from the liquid consistency, to set into the chicken like step 3 above). Serve with celery and ranch dip (to cool it down). You can add less sauce if you do not like it too spicy). If you have kids at your get together either cook up a second bag, or divide your bag in half and serve the kids the popcorn chicken with no buffalo sauce. You can then serve theirs with a small bowl of ketchup, BBQ sauce and ranch dip so they have plenty of dipping options. This is a super easy way to have something to serve for everyone! 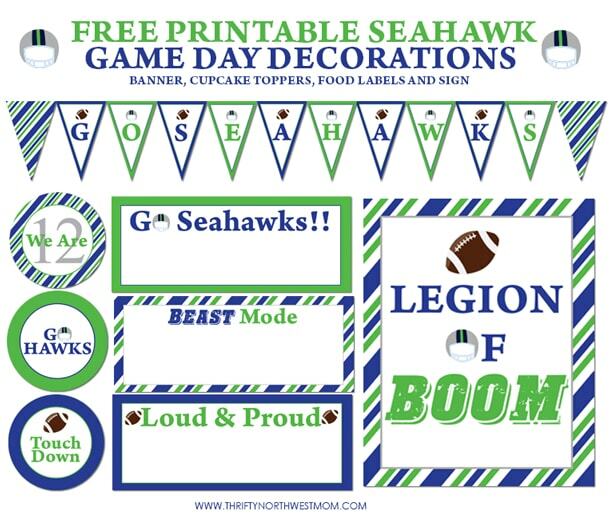 Plus, you can dress up your Seahawks party with these free Seahawks party printables to dress your chicken up even more! ABOUT THE PRODUCT: Foster Farms Frozen Cooked Chicken products are versatile, center-of-plate solutions that are ideal for quick and easy meals. From traditional favorites like wings and nuggets to original variations like Kettlecorn Chicken and Orange Chicken, Foster Farms offers a variety of 100 percent all natural frozen cooked products to meet busy consumers’ needs. There are never any added hormones or steroids in our Frozen Cooked Chicken products. For more information please visit www.fosterfarms.com. Disclosure: Foster Farms has sponsored this giveaway & will be providing the vouchers for the Thrifty NW Mom winners randomly chosen. All opinions are 100% mine. See our disclosure policy for more details. Here’s a printable version of the 2 Ingredient Buffalo Chicken Bites recipe for you to print off to put in your recipe binder or notebook. Need a winning game day dish! These chicken bites takes only 2 ingredients to make! Bake the Popcorn Chicken according to to the instructions on the bag (cook it directly from the freezer, making it perfect for last minute get togethers). Add approximately 1/4 cup of Franks Red Hot Buffalo Hot Sauce (or your favorite Buffalo Sauce) to the pan (more or less depending on your taste). Toss until all pieces of the popcorn chicken are coated. Place it back in the oven and cook for 5 more minutes to let the sauce saturate the chicken, and set (so it goes from the liquid consistency, to set into the chicken like step 3 above). Serve with celery and ranch dip (to cool it down). In the oven with a little bit of plum sauce for dipping. In the oven with some lemon pepper and ranch dressing for dipping. Lazy chicken Parmesan. Heat, top with sauce and cheese. We like them with ranch and tartar sauce for dipping. My kids like them with barbecue sauce! I love them with barbeque sause or siracha. My family loves the popcorn chicken baked in the oven with ranch & bbq for dippin’! I use the chicken patties to make Chicken Parmigiana. I eat the buffalo and hot and spicy plain, maybe with some rice. On the other breaded varieties, I eat them with mashed potatoes and country gravy. I subscribed to your emails with the email attached to this comment. With homemade tartar sauce for dipping – but we may have to try the buffalo sauce, it sounds yummy! I’ve never used the cooked chicken but I always have a bag of Foster Farms chicken in my freezer. Sandwiches, salads, baked, and grilled. I like to cook up the strips, cut them up and put them over a salad with blue cheese for buffalo blue cheese salad. Or BBQ chicken salad. Love the new Foster Farms Popcorn chicken baked with bbq sauce. In the oven with Kalbi marinade!!! My favorite way is buffalo style for sure. Love this recipe. i like to serve it with ketchup! As an easy weekday meal! I serve with bbq sauce for dipping! We serve them with honey mustard! We just use ranch or ketchup!